The Big Crush is Amador’s annual Harvest Festival and a great opportunity to see grape harvest in action! 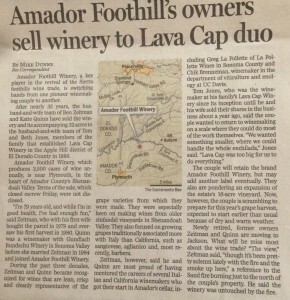 Join the new owners of Amador Foothill Winery for delicious foods, including zinfandel brownies. Enjoy a chance to chat with winemaker Tom Jones and his wife Beth and sample Tom’s new blends from the barrel. All of Ben and Katie’s wines will be available for sales and tasty pairings with Beth Sogaard’s catering. 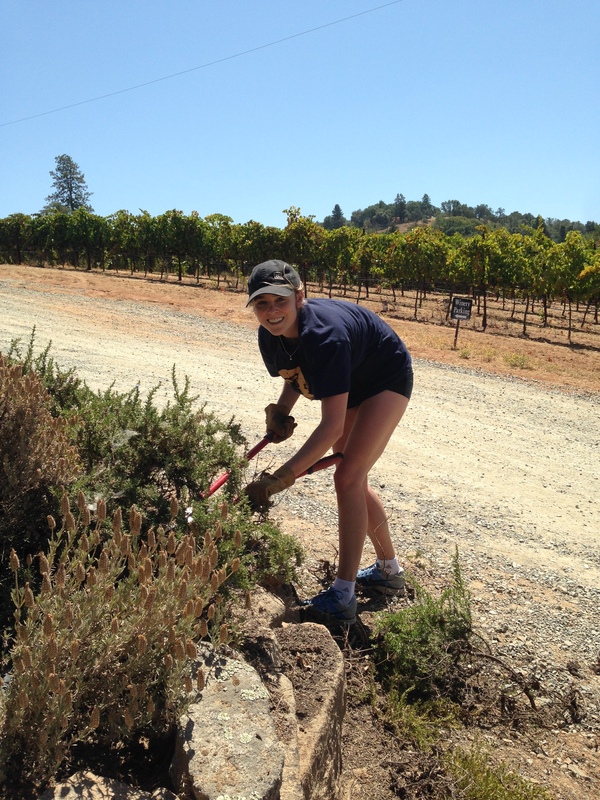 Beth and Tom look forward to meeting you as the newest members of the friendly Amador winemaking community! For more information on The Big Crush and to purchase tickets, click here. 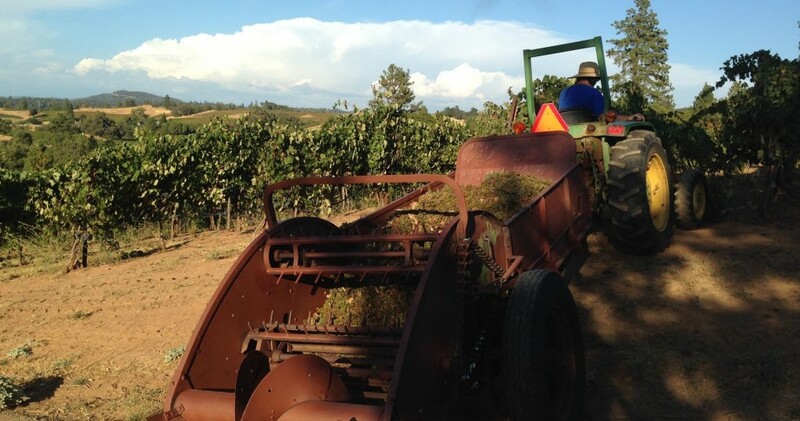 Spreading grape skins in the vineyard after the first day of harvest. A few changes have started to take place at Amador Foothill Winery! 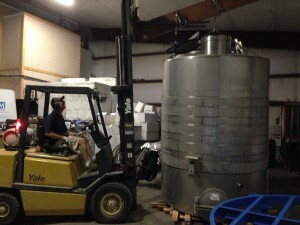 Winemaker Tom plans to bring several of the wine tanks into the cellar where they can be more readily monitored and cared for. Allie is beginning to give attention to the exterior vegetation. Fun to see the new developments start. The crush will start next week! Raised in Northern California Thomas (Tom) graduated from University of California, Davis with a Bachelor’s of Science degree in Geology, 1980. He worked a harvest for a micro-winery near the California Coast soon thereafter. 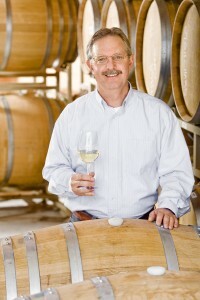 Enthused by all aspects of winemaking, Tom attended graduate school at University of California, Davis in the 1980s. While completing a Master of Science degree in Food Science (Enology & Viticulture) Tom became the founding winemaker for his family’s winery, Lava Cap, in Placerville, California. He developed Lava Cap’s reputation for award-winning wines from 1986 to 2013 and then chose to retire to begin new endeavors. Tom brings a joy of engineering and old world finesse with recognition of showing the best from the vineyard to handcraft his balanced, flavorful wines. He is well known for exquisite white wines, including Chardonnay, as well as supremely well-structured red wines such as Zinfandel and Barbera. Tom lives with his wife Beth near the winery. In his free time he enjoys exploring the remote regions of the Sierra Nevada Mountains and playing golf. August 18, 2014 (Plymouth, CA). 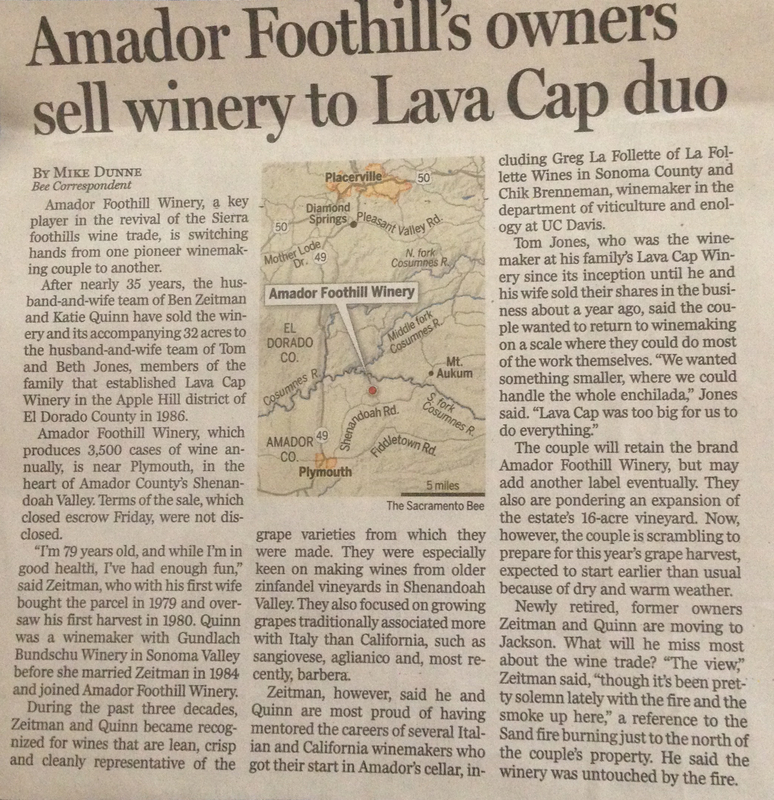 Tom and Beth Jones, former stakeholders of Lava Cap Winery, have recently purchased Amador Foothill Winery in the Shenandoah Valley of Amador County. In this noted Zinfandel region of the Sierra Foothills, Amador Foothill Winery was established over three decades ago. Tom’s winemaking aspirations drew him to the exceptional terroir and adventuresome winemaking spirit in the Shenandoah Valley Appellation. Both Tom and Beth are enjoying the warm welcome that they have received so far and look forward to opening the tasting room this Fall 2014. Purchasing Amador Foothill Winery near the onset of the 2014 harvest is daunting but Tom will build on the long legacy left by former winemaker-owners Katie Quinn and Ben Zeitman. The winery enjoys a panoramic Sierra view and new gravity fed crush techniques paired with old growth vineyards will allow a new leaf to develop in the Amador Foothill Winery story. Beth will open the tasting room to visitors this Fall. Join her at the winery Friday through Monday 11 am to 5 pm for a chance to taste and chat. It’s well known that the Shenandoah Valley Appellation is ground zero for great Barbera wines. Many of our neighbors have produced some stunning Barberas, and the area continues to receive more and more recognition for this variety. We decided to plant Barbera vines in 2008 after getting tired of begging bottles of Barbera from our neighbors (or trading for our Aglianico). We planted 1.5 acres of vines and, now after 5 years, are excited to offer our first vintage of this great food wine. The official release was April 12, 2014. The new vintage of Katie’s Côte debuted on March 1st. The blend of 66% Grenache and 34% Syrah was a big hit with our Behind the Cellar Door weekend participants. Also released that weekend was the 2013 Rosato of Sangiovese – our dry, fruity and flavorful 100% Sangiovese rose from estate vines. Anticipation is growing for the release of Amador Foothill’s first Barbera, which will be at our 34th annual Open House, April 12 & 13, 2014. Don’t just take our word for how good these wines are. Follow this link to read a recent review of our current and upcoming releases by Dr. Vincenzo Caggiano, co-owner of Biba Ristorante in Sacramento. Sauvignon Blanc and Semillon: Both varieties matured at the same time allowing us to co-ferment this year at our normal 75/25 ratio. The aromatics and flavors are quite enticing in this young wine, which will be bottled in January. Aglianico: We decided to bin ferment the 4 tons this year. With a couple days of cold soaking and vigorous punch downs twice daily for a week, the resulting pressed wine shows the most intense flavors and color we have ever seen from our vineyard. By October 28th, everything had been picked, fermented and pressed with the exception of a ton of Semillon for our late harvest wine. Those grapes were picked on Nov 7th, our latest picking date ever. On a sad note, Lena Esola passed away in July. The vineyard is now in the capable hands of Lena’s daughter Denise who intends to continue the farming tradition started by Giacomo and Louise Esola who settled in the Shenandoah Valley in 1910.